Although predominently situated in the major cities, Cardiff in particular, Wales has a vibrant gay scene and it's own Pride / Mardigras festival held in Cardiff every year. Like everywhere else as gay culture has become mainstream many of the venues are now mixed gay /straight which is definately for the better. If you'll looking for spend the weekend in Cardiff check out the many discount hotels offers on booking.com for Cardiff or check out the gay friendly venues we have listed on this site. Cardiff Mardigras 2014 tales place on tbc. Cardiff Mardigras are planning to paint the town pink with the biggest gay party Wales has ever seen. Over 40,000 people will flood into the Welsh capital for this amazing weekend of celebration, where we enable a visible and proud gay, lesbian and bisexual community in the Principality. See UK Gay Guide and below for a A-Z list of UK gay pubs, clubs and saunas in Wales, pride events etc. We have also listed Welsh community, support and Sports groups on www.gayindex.co.uk. See our 2014 UK Pride Events diary. 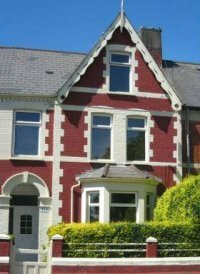 Description: The Ty Rosa is a boutique gay-run guest house just 15 minutes from Cardiff city centre. It offers stylish rooms with free Wi-Fi and an extensive breakfast menu including traditional, continental and vegetarian. Every morning, guests can enjoy such classics as eggs Benedict, smoked salmon and pancakes, along with a selection of fresh fruit salads, cereals and juices. The evening menu offers traditional Welsh dishes. The Ty Rosa cooks from fresh and can cater for coeliac, gluten and dairy free diets. Ty Rosa, Welsh for pink house offers a warm welcome to all, whatever your orientation. Close to Cardiff Bay the Grangetown Railway Station is a 2-minute walk away and services the city centre. Free parking is available. There are 5 chic rooms named after Welsh castles and an annexe building with 3 rooms named after islands. Each room features a seating area with a DVD player. 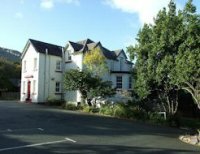 Description: Charming self-catering cottage in Wales, nestling at the base of the Black Mountain. On the edge of the Brecon Beacons National Park and close to the Gower Peninsula and magnificent Welsh coastline with its fabulous beaches. Sleeps 5, with a 4-Star grading from the Welsh Tourist Board. 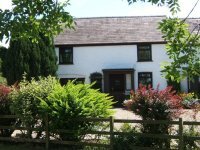 Standing Stone Cottage is set in the picturesque farmyard on Llwyncrwn Farm, a 30 acre small holding in the beautiful Carmarthenshire hills. The barn and farmhouse date from 1830 and are surrounded by 30 acres of farmland. A small orchard next to the cottage contains an ancient standing stone. The barn has been refurbished to offer stylish, spacious and comfortable accommodation - ideal for those in search of a peaceful and rural holiday. Within easy reach are the excellent beaches of the Cardigan coastline, Brechfa Forest (ideal for walking and cycling) and the Teifi and Tyweli Rivers (fishing available).Sleeps 4 (1 double, 1 twin), Log burning stove (logs included), Short breaks available. We also keep a range of livestock; currently chickens, ducks and pigs. 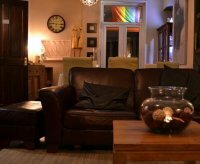 Description: : Exclusively lesbian and gay accommodation, Separate restaurant and licensed bar connected with Jacks Health Hydro. Pennant Hall is a period building set in its own floodlit grounds overlooking the sea. The village nestles between two headlands at the foot of Snowdonia National Park with Mount Snowdon as its centrepiece. Description: Three Star Guest House. All rooms double/twin bedded with En-Suite shower rooms and all ground floor. Also Four Star Self Catering Accommodation. Carnivore,Vegetarian and Vegas cuisine. Gay owned. Open all year. Pets welcome. No Children. Contact Chris and Neil. With a fantastic atmosphere, great drinks prices and two stylish floors, Bar Icn is a key ingredient to any night out in Cardiff. Bar Icon is situated on two floors, you have the choice of the upstairs dance area and bar with state of the art sound & lighting or you have the main Bar area kitted out in funky lime green walls with fabulous contemporary lighting creating a wonderful party atmosphere..
Cardiff's premier gay men's bar. 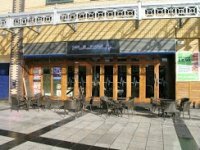 Eagle is located in Charles Street, the heart of the city's gay scene. We are a basement bar opposite The Locker Room (gay sauna), and just along the road from Bar Icon and Minsky's Show Bar. As we are a private club at weekends you have to be a member to gain entry. Membership is just Â£3 for 12 months, and after this there will always be free entry. Membership will be renewed annually. Each Saturday we have regular themed nights for Leather and Rubber (1st Sat), Bears (2nd Sat), Uniform (3rd Sat) and Construction (4th Sat). Welcome to the Minskys Showbar in Cardiff, offering the best Drag Entertainment & Hen Nights in Cardiff. MInskys offers live comedy drag every Friday & Saturday night. We have something for everyone whether youre out on a hen nights, birthday or just a night out with friends, why not join us for the best party in town. Our regular Friday & Saturday night shows kick off from 9:30pm and feature Live comedy drag, song and audience participation where the star of the show could be you. A mixed gay/straight club and bar set over three levels with entertainment and dance throughout the week. EVERY NIGHT we have Cheeky Hour drinks promotions plus LIVE entertainment + DJ's. It's FREE ENTRY all night Sun to Thurs & before 11pm on Fri & Sat. The Original WOW Club, downstairs in WOW Bar is open all week providing regular special nights.